I'm a big fan of small cars, and, like many small-car aficionados, I'm frankly tired of not having a car that can be mostly obscured by a grain of sand. 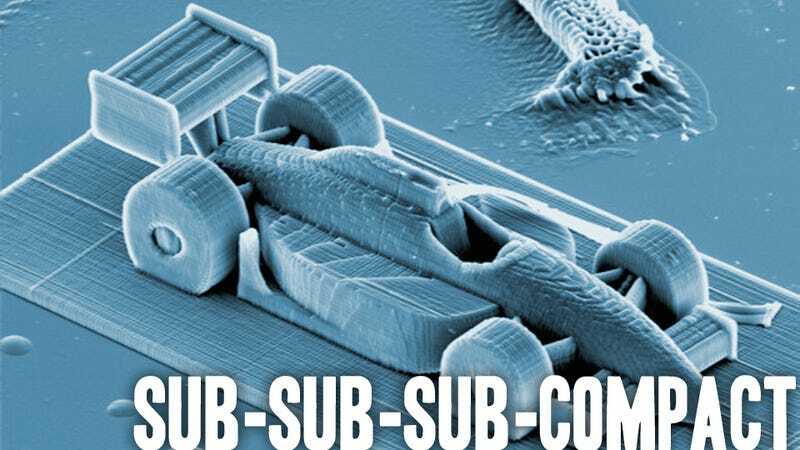 Thankfully, that problem has been solved by researchers at the Vienna Institute of Technology, who have used a new 3D printing method to produce a racecar about 285 µm (micrometers or microns) long. That's the thickness of a human hair. The 3D printing method uses a liquid resin, hardened by a laser beam guided with movable mirrors. The system is remarkably fast, able to deposit and fuse 100 layers of 200 lines of polymer per layer in under four minutes. Even more amazing is the resolution: doing this level of detail at the nanoscale level means larger objects can have a truly remarkable intricacy. I've used other types of 3D printing for projects, and have been able to see the individual layers, like aliased pixels, on the final product; this is well beyond "retina display" levels for physical objects. Now I just need to see if I can get an implant so all my blood and sperm cells have sweet rides to tool around my body in.